Charles Knight reconstructions of two notoungulates from the early Miocene of southern Argentina: the interathere Protypotherium (left) and the toxodontid Nesodon (right). From Scott (1932). Notoungulates – literally “southern ungulates.” – may be the most emblematic of all extinct South American mammals. Notoungulates were the most abundant of the native South American ungulates, and probably more species of notoungulates have been named than all other groups of endemic ungulates combined. The group includes more than 150 extinct genera in around a dozen families. Notoungulates lived throughout most of South America for nearly the entire Cenozoic, but only the toxodontid Mixotoxodon ever expanded its range into another continent; in the Pleistocene, this animal lived in Central America and the extreme southern United States. Unlike litopterns, notoungulates have not yet been found in Eocene deposits of Antarctica. This is surprising considering the abundance of notoungulates at many South American fossil sites of this age. 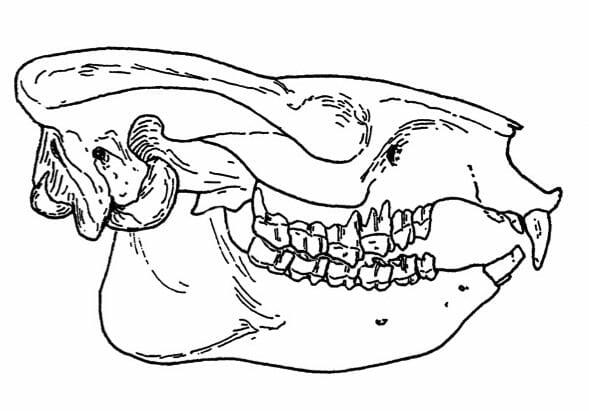 Nomenclature for the molars of a typical low-crowned notoungulate such as an henricosborniid. Tooth outlines from Cifelli (1993). Notoungulates are united by characters of their ear region and their teeth, including the presence of a loph on their upper molars known as the “crochet”. A group of Paleogene mammals from the Northern Hemisphere known as arctostylopids were once thought to be closely related to notoungulates, but it now appears that dental similarities evolved independently in the two groups. Thus, with the exception of Mixotoxodon, the notoungulate radiation was exclusively a South American phenomenon. Evolutionary relationships of traditional notoungulate families based on Cifelli (1993). Cifelli’s (1993) analysis of notoungulate relationships suggested that notoungulates can be divided into two main groups (suborders), Toxodontia and Typotheria, plus two early-diverging notoungulate families. By and large this arrangement has been supported by more recent studies of notoungulate evolutionary relationships such as that of Billet (2011). However, this and other studies have highlighted the fact that several traditionally-recognized families probably are not natural (monophyletic) groups. In other words, some of their species appear to be more closely related to those in other families than other species in their own family. These families of more questionable status include Henricosborniidae, Isotemnidae, Notohippidae, Oldfieldthomasiidae, and Archaeohyracidae. With the exception of Notohippidae, remains of these families are only found at sites older than Miocene in age (23 million years old). The suborder Toxodontia mostly includes large (sheep-sized) to very large (hippopotamus-sized) species. It is named for the family Toxodontidae, which itself is named for Toxodon, a genus of mammals that survived until the Pleistocene megafaunal extinction some 12,000 years ago. This genus, family, and suborder were all named by the great English anatomist Richard Owen based on fossils collected by none other than Charles Darwin. Three toxodont families survived well into the Miocene: Homalodotheriidae, Leontiniidae, and Toxodontidae. Among these, only the toxodontids were widespread, abundant, and diverse during this interval. They were also the only toxodonts still living in South America during the Great American Biotic Interchange. The suborder Typotheria mainly includes small (rabbit-sized) to medium (dog-sized) species, many of which have rodent or rabbit-like cranial and/or skeletal features. This group was also named for one of its most recent and largest members, Typotherium, which is now known as Mesotherium. Ancestrally, typotheres are characterized by a “face” pattern of enamel-lined fossettes in their upper teeth (see below). 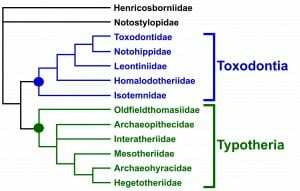 As is true of toxodonts, three typothere families persisted well into the Miocene: Interatheriidae, Mesotheriidae, and Hegetotheriidae. However, all three of these were rather widespread and abundant during this interval, and the latter two survived into the Pleistocene. Partially worn upper molar of the interatheriid Notopithecus. Tooth outline from Cifelli (1993). The four major families of Miocene notoungulates (Toxodontidae, Interatheriidae, Mesotheriidae, and Hegetotheriidae) all independently evolved simplified, ever-growing (hypselodont) cheek teeth. They are the only ungulates other than certain giant rhinoceroses (Elasmotherium spp.) to do so. Early members of these groups, as well as other hypsodont notoungulates, can often be distinguished by the pattern of enamel-lined structures on their molars. When a mammal tooth erupts, it has a continuous covering of enamel. However, in many herbivores that eat abrasive foods, the enamel covering on the surface wears away, exposing the dentine underneath. (Humans and other mammals that eat relatively soft foods generally maintain the enamel covering throughout their lifetime.) If the enamel on the surface of a tooth extends downward into the tooth crown during development to form a pit, the pits are left behind as enamel “islands” once the remaining enamel on the surface of the tooth wears away. These islands of enamel that are surrounded by dentine are known as fossae (singular: fossa) or fossettes in upper teeth and fossettids in lower teeth. Ancestrally, a slightly worn typothere tooth has a characteristic pattern of fossettes that resembles a face; the large, central fossa is the “mouth,” and the two labial or buccal fossettes are the “eyes.” This pattern is not usually visible in unworn teeth, nor can it be seen in heavily worn teeth. In later-diverging typotheres, this ancestral condition has been modified to such a degree that it is no longer recognizable at all. Very hypsodont (or hypselodont) species have lost all enamel islands due to developmental constraints; the only similar structures are folds of enamel that extend inward from the lingual and/or buccal surface of their tooth. Scott, W. B. 1932. Mammalia of the Santa Cruz Beds. Volume VII, Paleontology. Part III. Nature and origin of the Santa Cruz Fauna with additional notes on the Entelonychia and Astrapotheria. ; pp. 157-192 in W. B. Scott (ed. ), Reports of the Princeton University Expeditions to Patagonia, 1896-1899. Princeton University, E. Schweizerbart’sche Verlagshandlung (E. Nägele), Stuttgart.